A firearm using the diminutive .22 rimfire cartridge should be in every survival/preparedness gear collection. Here is why you should consider adding one to yours. The favorite cartridge of most .22 shooters is the .22 Long Rifle. The 40 grain bullet is very effective. I love a .22 rimfire rifle and hunt with one every fall. My favorite small game animal is the squirrel, and taking one with a rifle is challenging. (Want a real hunting challenge? Try harvesting a squirrel with a flintlock rifle!) I voluntarily handicap my hunting success for the sake of sport. Here are five reasons you need a .22 rifle. 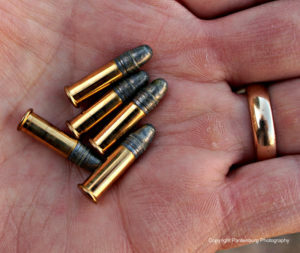 Cost: The most inexpensive cartridge firearms are .22s. Ammo is generally very affordable, and that makes target practice a lot more practical. A box of 50 .22 Long Rifle cartridges is also lightweight and easy to carry. And .22 rifles and handguns are also the least expensive firearms to buy. Watch the sales around the beginning of hunting season and you will probably find good deals. Efficiency: Growing up an Iowa farm boy, I’ve put down several injured hogs that weighed several hundred pounds each with my Ruger 10/22. A shot placed behind the ear, aiming for the off side eye, brought an instantaneous end to the animal’s suffering. The Ruger 10/22 is a rugged, reliable .22 caliber semi-automatic rifle. I’ve had this one since 1966. “Death in the Long Grass” author, Peter Hathaway Capstick, claimed he once killed an elephant on a bet with a .22 LR. He was working at the time as a Kenyan government hunter culling herds that were over-grazing and rampaging through villages. He did not recommend the practice but claims he knew a particular spot where an artery ran just below the hide. I take all such tales with a grain of salt, but obviously, shot placement is always critical. A .22 is illegal virtually everywhere for hunting big game animals, so don’t plan on using one or considering a .22 as a backup big game rifle. Training: A .22 has no recoil, and the sound is not ear-splitting. This allows the newcomer to concentrate on aiming, trigger control and safe gun handling without worrying about getting smacked in the chops every time the trigger is pulled. The .22 gun handling and safety skills carries over to other, bigger firearms. If you’re setting up a survival firearms battery, it might be a good idea that the .22’s action be the same as that of the larger centerfire rifle. Under stress, people will revert to their previous training. A .22 is also a valuable tool for people learning to hunt. Anyone who does a lot of rabbit or squirrel hunting will find the activity is superb training for whitetail deer hunting. 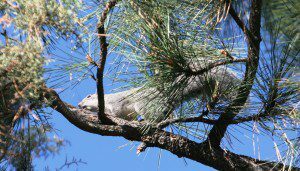 And, the stalking and concealment skills learned in squirrel hunting could be applied to combat. Hunting: Every big game animal in the United States has been taken with a .22. But that doesn’t mean you should plan on using a .22 for big game hunting. For hunting small game, though, the .22 has no peer. It is my caliber of choice for squirrel and rabbit hunting, and a .22 can also help keep the predators in check. Squirrel hunting can be challenging, but the meat is tasty and nourishing. Don’t underestimate the need for controlling smaller pests. That gopher or rat ravishing your garden could be more dangerous to your long term survival than any number of big game or human predators. Protection: The .22 ranks about dead last on my list of protection calibers, and is not my choice for a self defense round. While there is no question a .22 can put down large animals or human predators, the small cartridge can only be used effectively by an expert. Unless the shot is placed in a vital area. the .22 doesn’t have the knockdown power to stop an attacker quickly. An additional benefit is ammo availability: It doesn’t matter how far you travel off the beaten path. Chances are any backwoods gas station or convenience store will have .22 ammunition. And during the apocalyptic Stuff Hits the Fan scenario, .22 rimfire cartridges would be prime barter items. So do you need a .22 rimfire? Obviously, I’m going to say yes. IMHO the only question is not if but when (will you get one). Use the tiny cartridge for target practice, training and protection. And shoot it a lot. SURVIVAL Fishing and Camping in Volcanic Mountains! !